Astronomers believe that the best way of finding extraterrestrial life could be to look for the heat that other civilizations produce using a mega telescope. And such a device has already been planned. Space.com reports that the huge 250-foot telescope would be named Colossus and its aperture would be more than twice the size of any existing lens. Scientists involved in the privately-funded project hope that the telescope would be able to spot cities or other signs of alien life on planets up to 70 light years away from Earth. 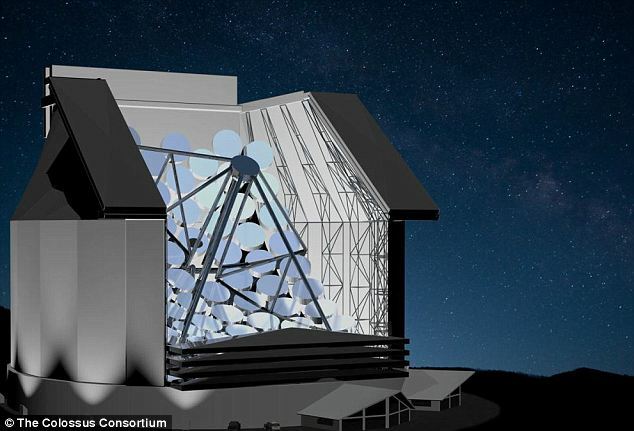 The telescope is expected to cost around $1 billion and will be built by The Colossus Consortium. ‘If we had an investor come and say “look, here are the resources you need,” we could have the telescope built within five years,’ Jeff Kuhn told Space.com. Kuhn is on the Colossus proposal team and an astronomer at the University of Hawaii’s Institute for Astronomy. The telescope would use thin mirror technology in efforts to keep the costs down. There is not yet a projected start date for the project. Kuhn told Space.com that it could be built in Baja California in Mexico, close to the National University of Mexico in Ensenada, which is a partner in the plans. Kuhn added that the telescope could detect local heat that would signal extraterrestrial life. ‘We do that by using the fact that the planet has to rotate, and that civilization is clustered either by the formation of continents or the use of land, which is agrarian versus organized into population centers. Astronomers have never received any definitive signs of alien life from space despite decades of searching. They have generally been listening for signals beamed out by extraterrestrial life. But this relies on aliens actually sending out signals and our ability to interpret them. Stephen Hawking has also warned about humans sending out our own messages into space in case we alert potentially hostile civilizations to our existence. The Colossus project doesn’t include this dangerous risk as it is a passive receiver that searches space without giving away our location. A US space firm is trying to raise £660,000 via crowdfunding site Kickstarter for a private space telescope that could scour asteroids looking for precious metals to mine. Planetary Resources wants to build and use satellite telescopes to hunt for asteroids orbiting Earth before using robotic spacecrafts to mine the asteroids for precious metals, water and other materials. The company has already received backing from Google’s founders – but is now asking for members of the public to donate to the project and get involved in hunting for suitable asteroids.If there is enough public support, Planetary Resources plans to launch its first telescope, called the ARKYD by 2015.